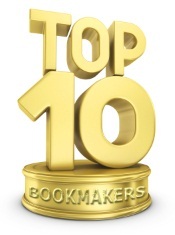 Funded in 2003, 10Bet has rapidly climbed in the top of the best online bookmakers from the world. Its costumers have benefited from a large range of bets, from the first football division in England, to the darts competitions. 10Bet has very attractive odds and also TotoPot contest, where the clients are invited to bet on 13 matches and if they the results right, they will win a sum of money that can arrive up to 15,000 Euros. There are some very interesting types of bets, like the number of cards, free kicks or the score at a certain minute. It also offers the possibility of live betting, in a modern structure, with a nice design, with lots of types of bets for each event. You can also make combo bets live, but with only one option. The odds are great and in the live offer there are all kinds of sports 24 hours per day. The options for deposit and withdraw are numerous: credit/debit card, moneybookers, neteller or bank transfer. The payments are processed in a short period and the website has the menu available in many languages. For every problem you have, you can get technical support by phone, email or chat 24/7. If you are a fresh bettor and you choose to open an account at 10Bet online bookmaker, you have 3 types of bonuses at your disposal: first deposit bonus, reload bonus and a cash back bonus. The first deposit bonus is up to 100 Euros and has a value of 30% of the sum you have deposited. You will get the bonus automatically, after playing it for 10 times, at odds of over 2.00. The reload bonus is given based on a code and is credited automatically at your next deposits, after playing it 5 times at odds over 2.00. The cash back bonus is given at certain periods of time and is deposited in the bettor’s account; right after the announced promotion was finished. If you want to be signed in on a safe and profitable online sportsbook, 10Bet may be just be the best solution for you. Good luck!